Overall revenue raised from company tax has risen, despite cuts to the company tax, according to a key business group that argues its analysis shows proposed tax cuts to be debated in federal Parliament this week will not risk the budget bottom line. The Australian Chamber of Commerce and Industry says it has examined tax revenue data collated by the Australian Bureau of Statistics over the past three cuts in the corporate tax rate, undertaken by both Labor and the Coalition government in the past 30 years. 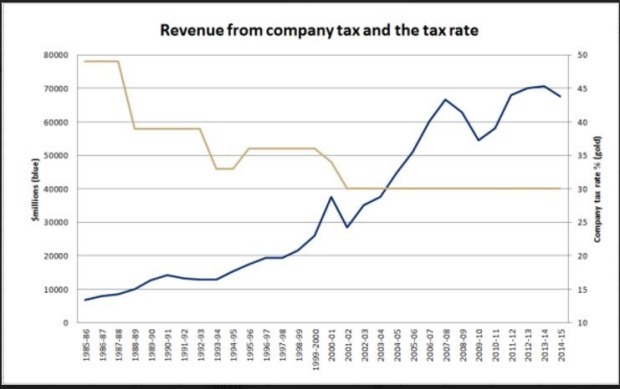 History shows company tax revenues rise after cuts in the company tax rate, after a short blip . Read the full article on the Australian Financial Review website.